After a way along the road, we turned right up a grassy track which soon became a decent track alongside the Allt Fionndrigh. 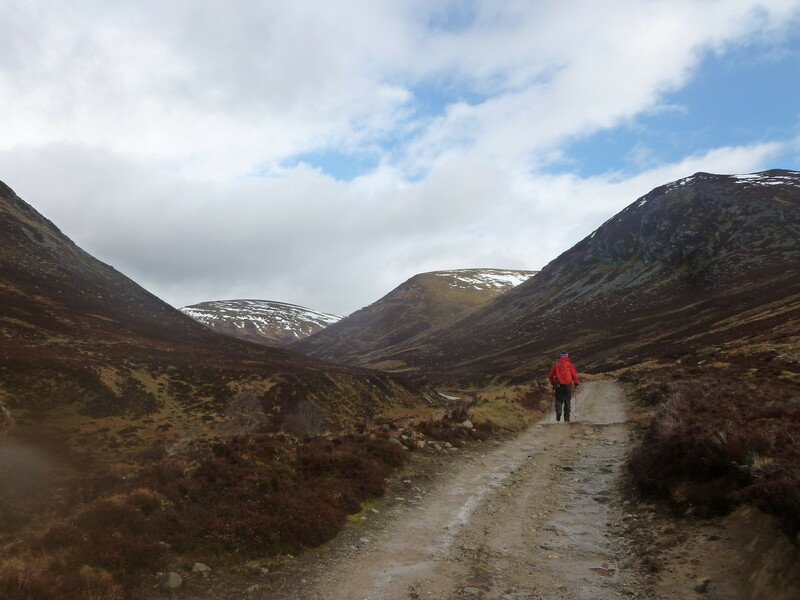 At this point the rain stopped and the sun even made an appearance, so our track up into Gleann Fiondrigh was really enjoyable - it was a lovely glen. 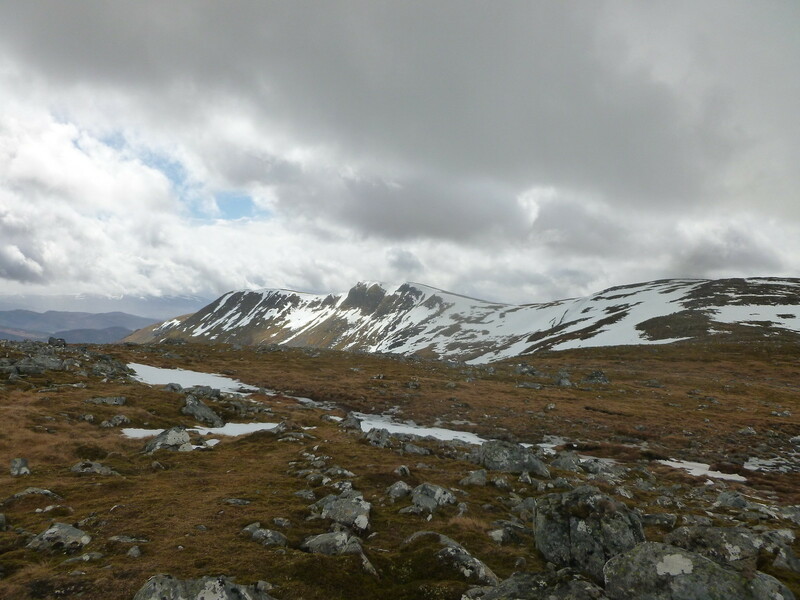 With the improved weather we could enjoy the beauty of the Glen, and as we got further in, the crags beneath the summit of Carn Dearg began to appear. It was mighty impressive! 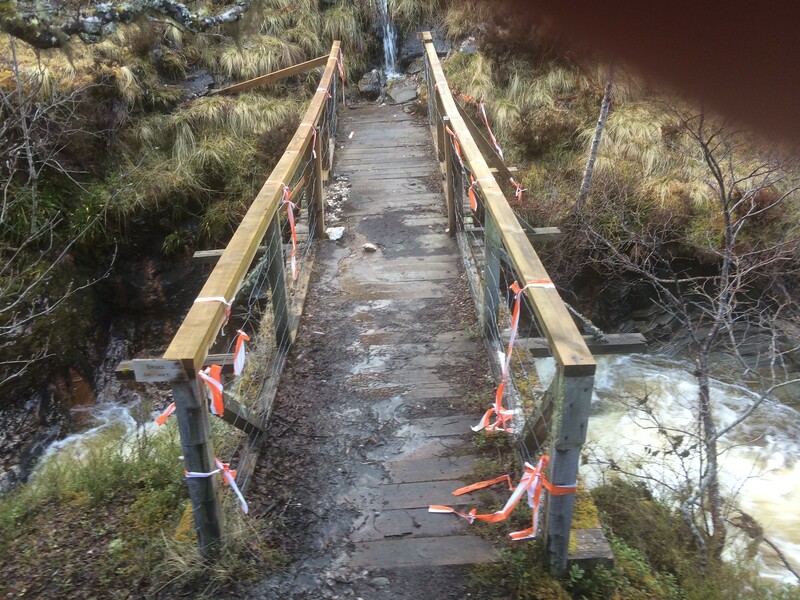 Eventually we reached the bridge and were relieved to find it still standing, although somewhat wobbly. 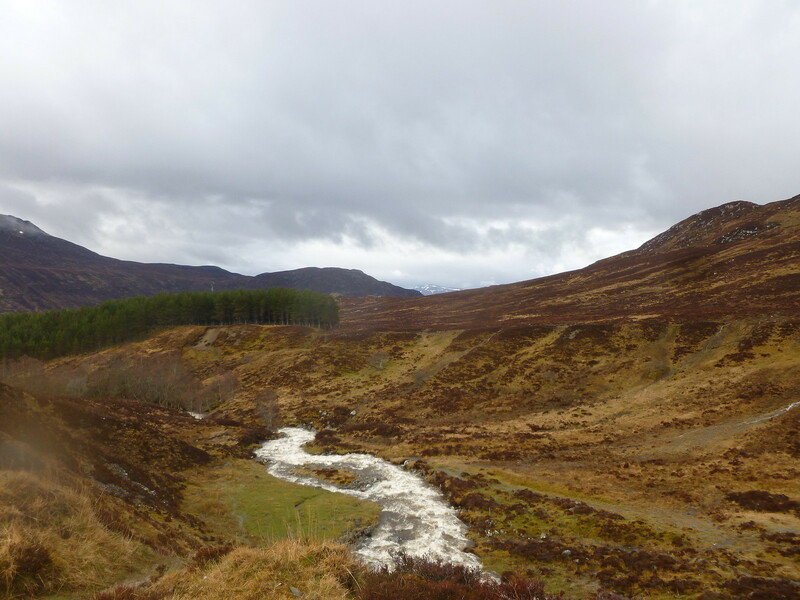 Safely across, there was a large mess of bog and stream to cross before reaching the almost equally boggy path. As is so often the case, just as we were starting to feel content with life, the universe and the weather, the rain began again. 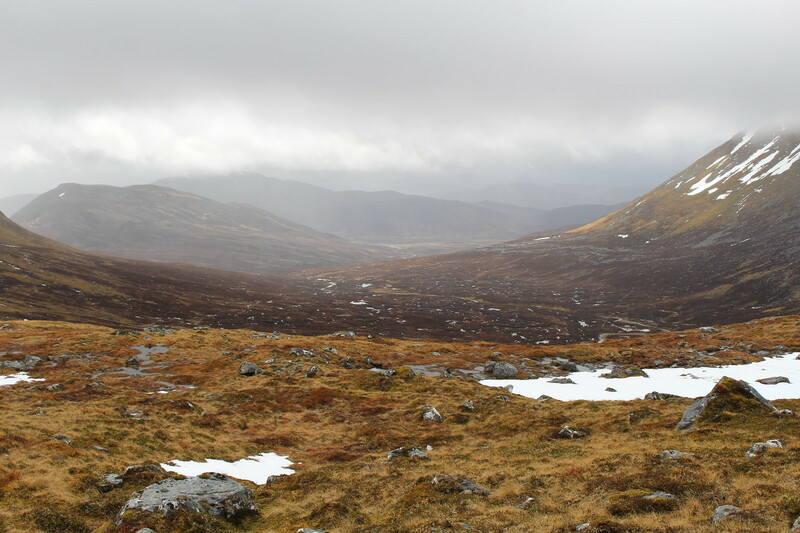 As we climbed up the bog, the rain got heavier and the gloom returned. 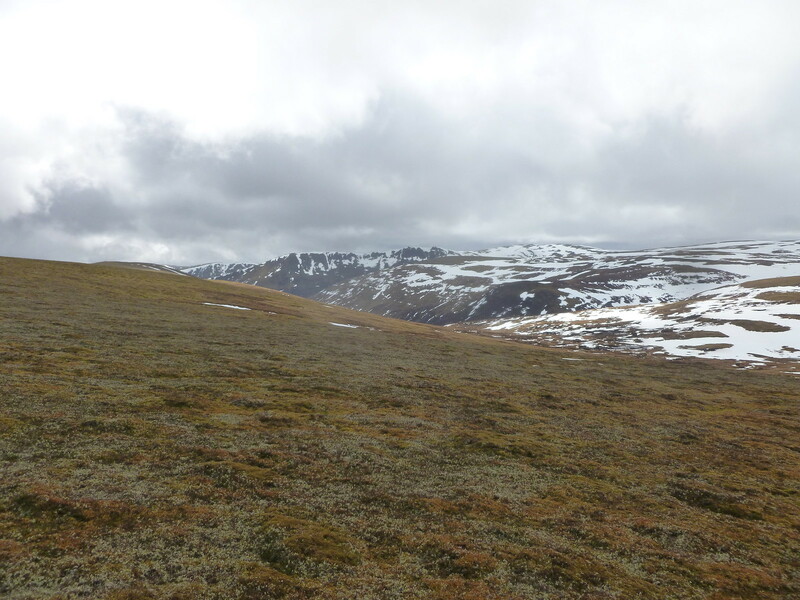 As we came out on the top of a very boggy bealach, we were greeted by rain, wind and desolation. 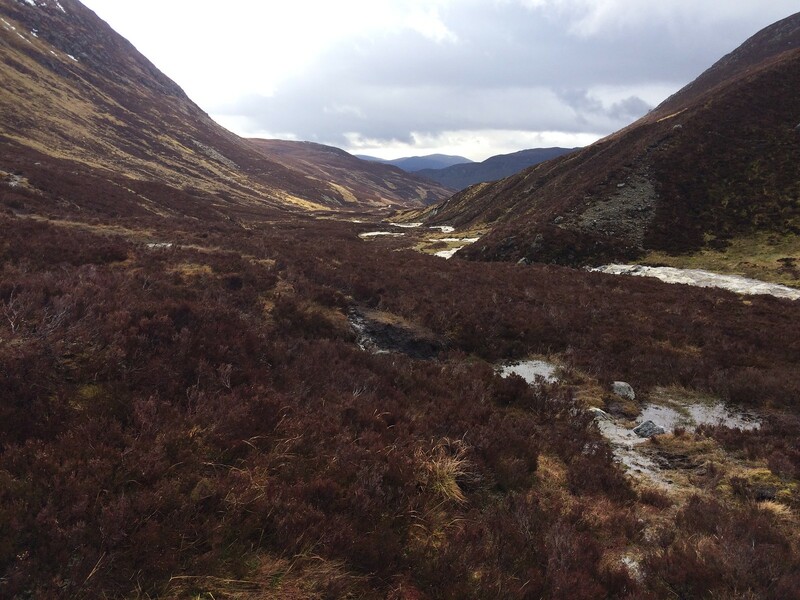 We plodded on, following a very vague path which soon led us towards some lovely wet squidgy peat hags. 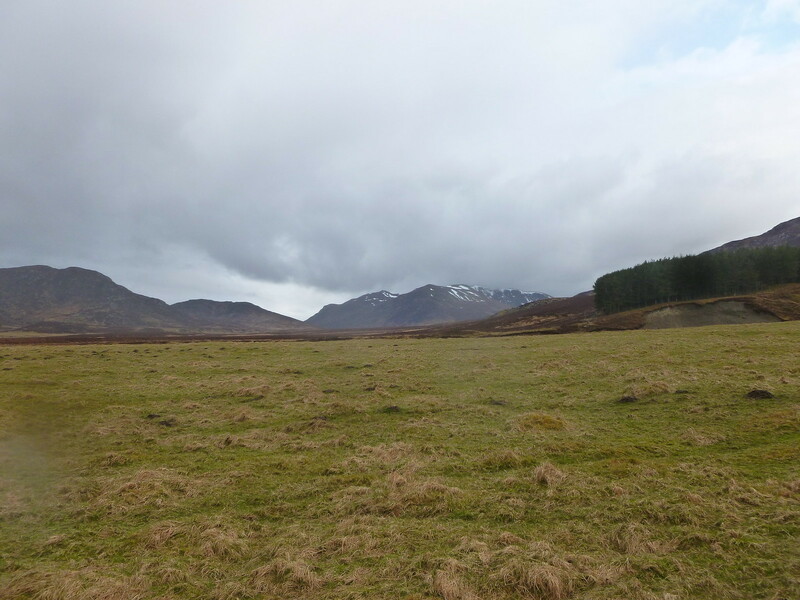 It was at this point I was starting to think that this might be the shortest ever walk report "we walked a long way through a bog in the rain. 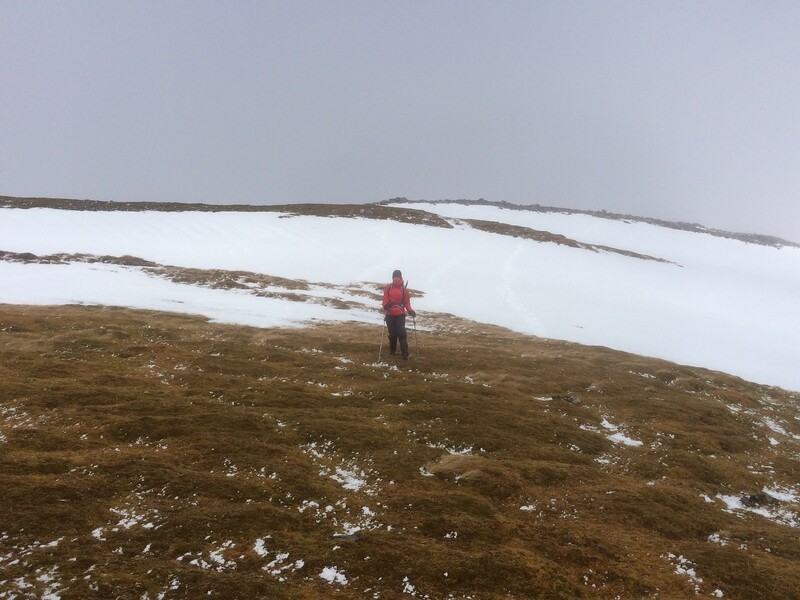 Here is a picture of some clag"
Reading the walk highlands description, it suggested sticking to the higher ground to avoid the worst of the bogs. 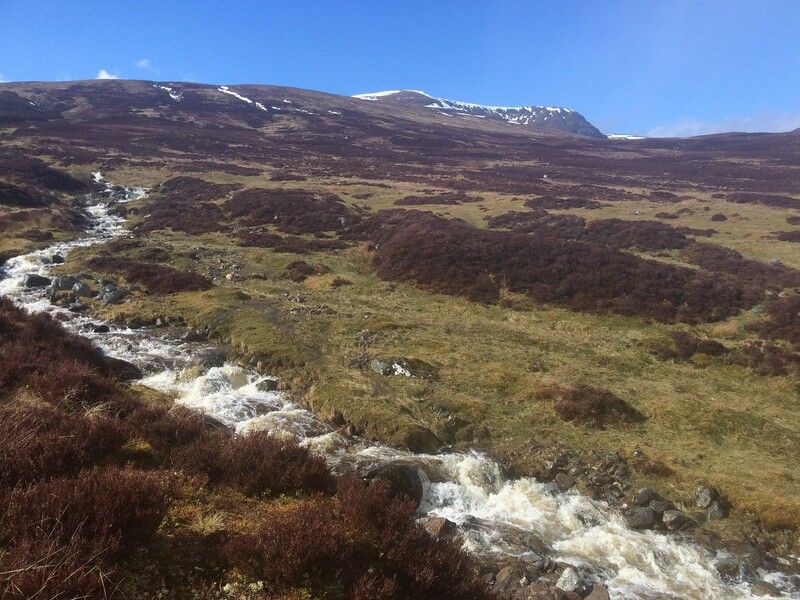 However, Hugh, ever in a hurry had decided to push on and was sloshing right through the middle of what should really be described as a marsh. Eventually we started to climb and traverse round the top of the bowl. The ground was a little less wet here now we were a little higher. 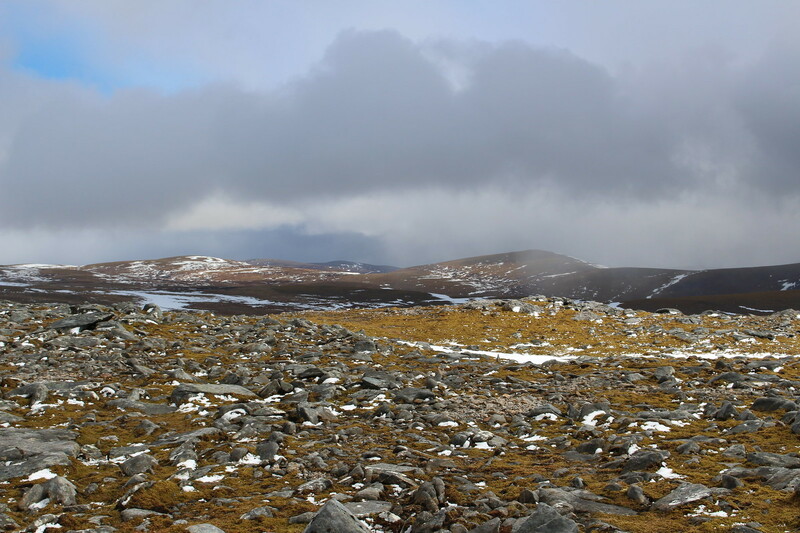 Unable to see clearly and unsure what the conditions would be like on the traverse round to Carn Dearg, we elected to climb the shoulder of Carn Ban and walk round the ridge to the summit from there. This wasn't a terrible plan although it did involve some unnecessary ascent and distance. 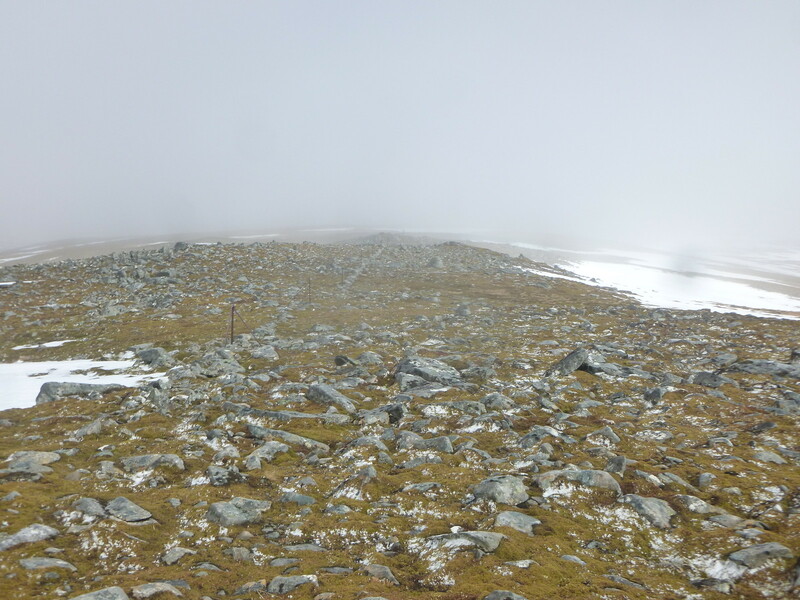 Eventually coming out on the top of Carn Ban, snow was blowing in our faces and it was pretty nasty. 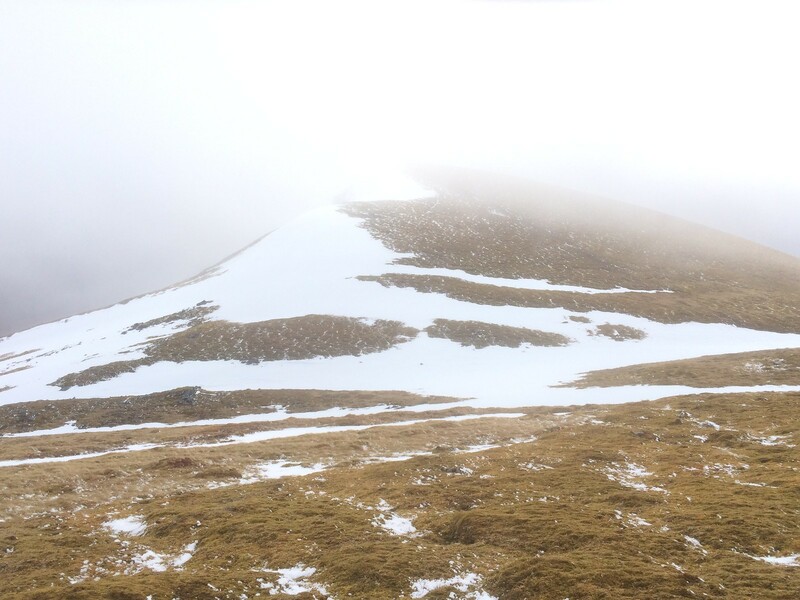 We persevered and as we were beginning the climb to the summit, it almost looked like it was about to clear. 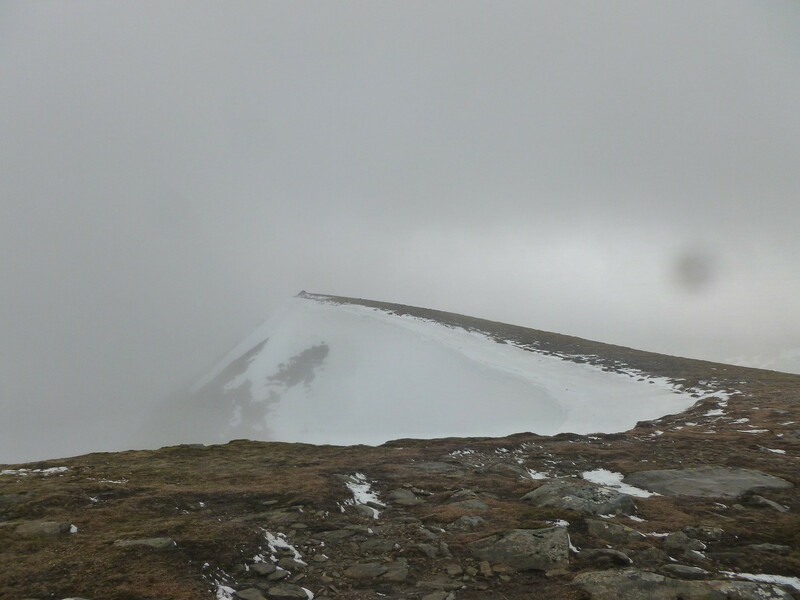 But, reaching the top, the clag was firmly back in place although the snow had at least relented a little. 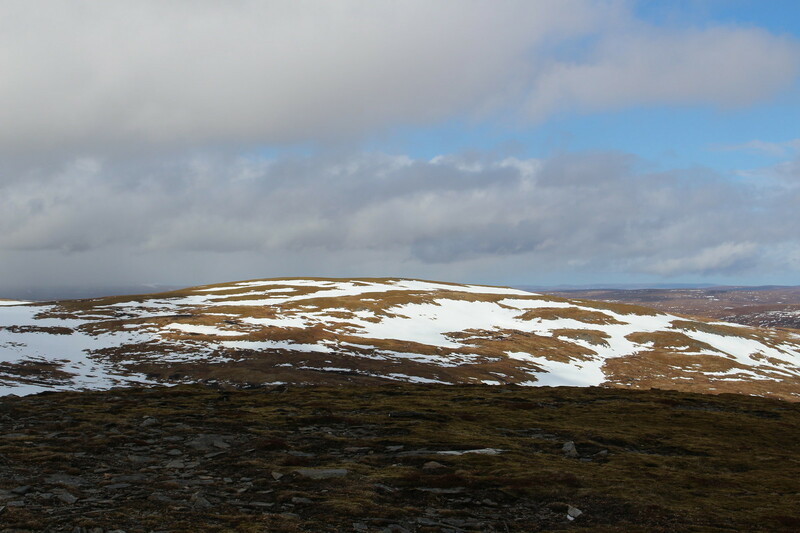 Heading fairly swiftly off the summit, we retraced our steps to the top of Carn Ban. 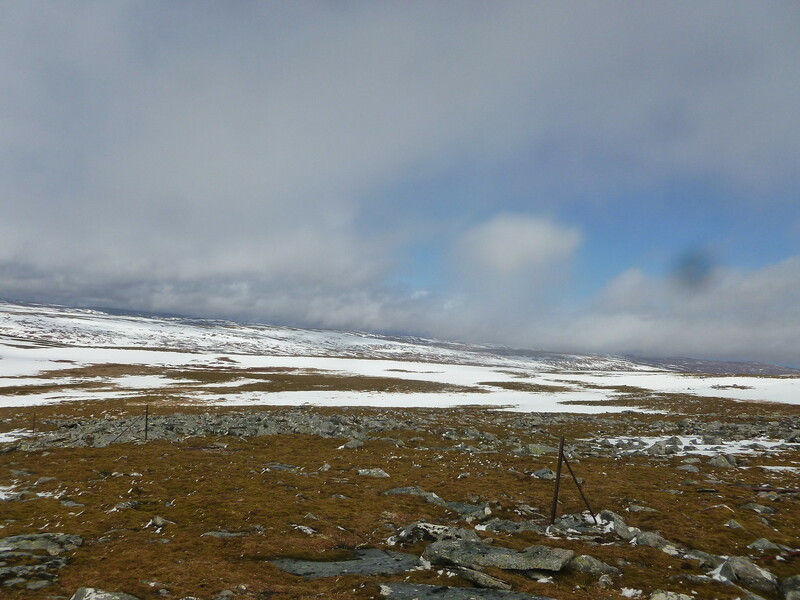 At this point it really did clear and we were able to see for miles across the vast emptiness of the Monadhliath. It really lifted our spirits and gave us hope for the rest of the day. We were also now walking with the wind behind us, giving our faces a bit of welcome respite from the assault they had endured so far. 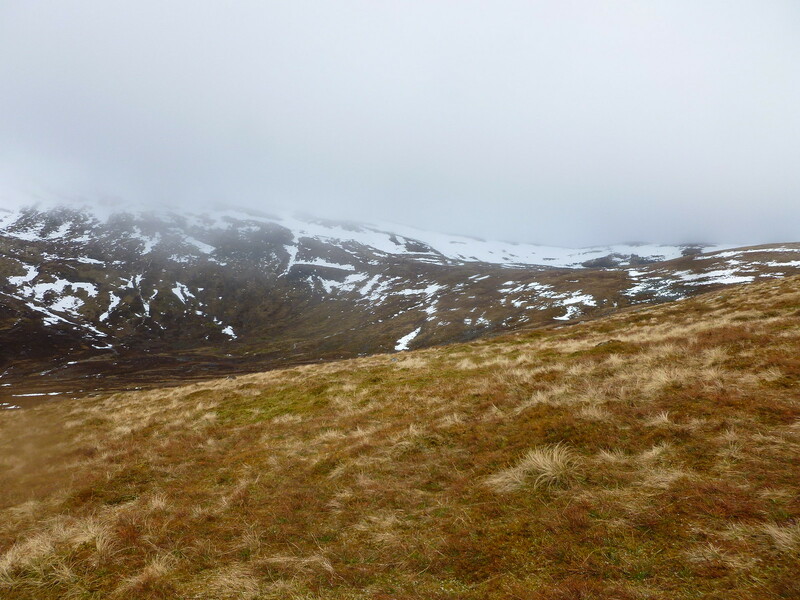 With visibility now returned, we easily located the fence posts that we were to follow across the mor and could see them stretching out for miles towards Carn Sgulain and A'Chailleach. It looked a very long way! 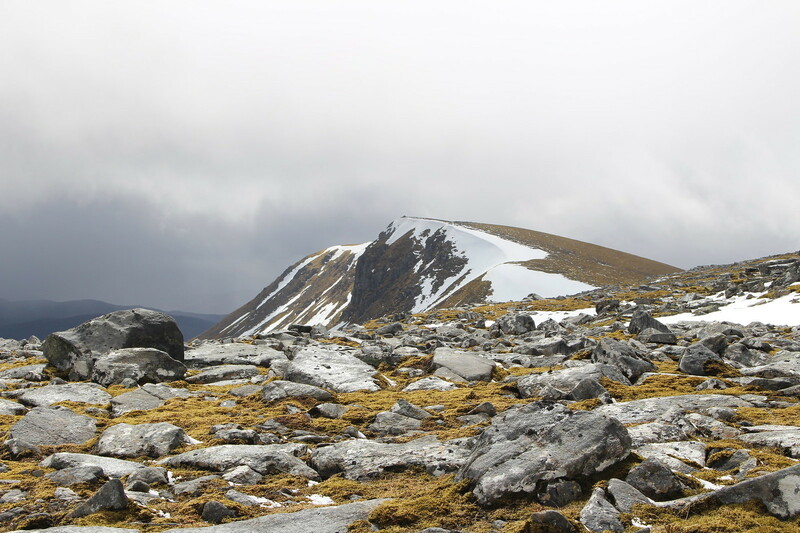 Looking back we could also see Carn Dearg, an impressive looking mountain. 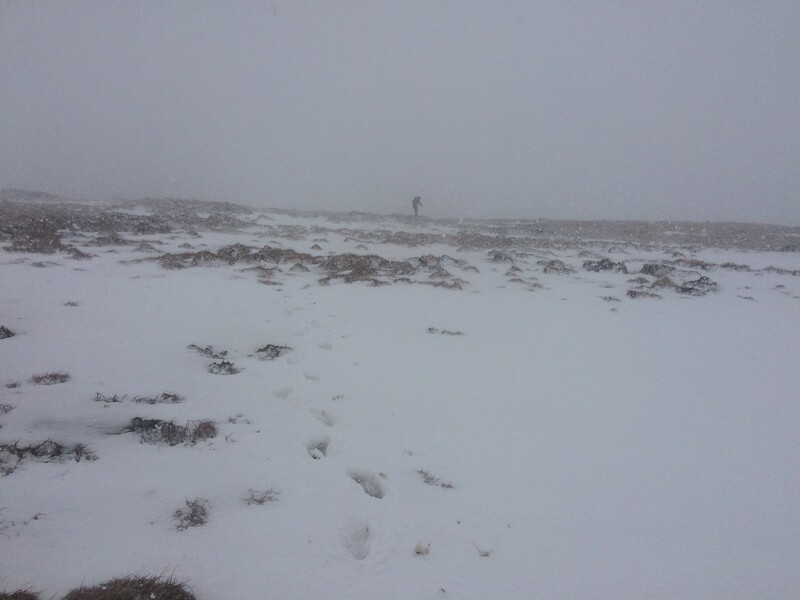 The walk across the moor was long but enjoyable for the most part. 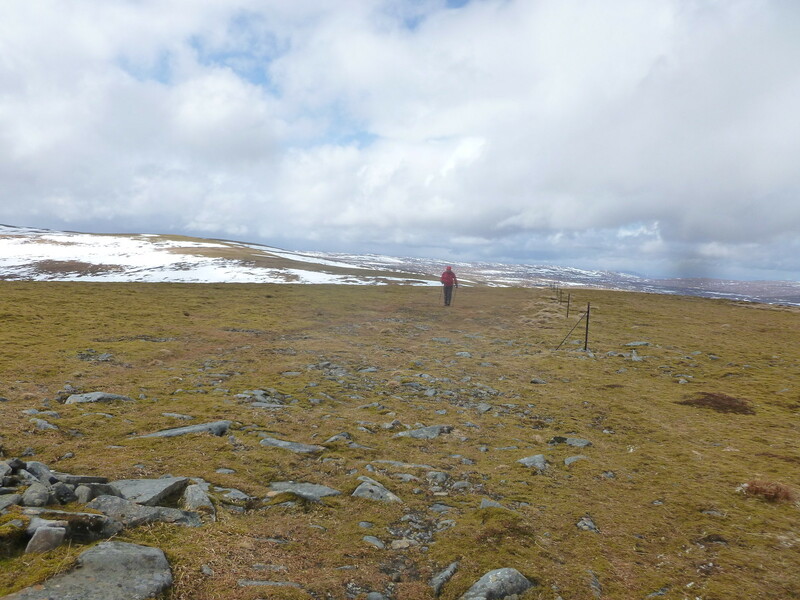 The weather was mixed - the clag and snow returned often, interspersed with periods of sun and good views. 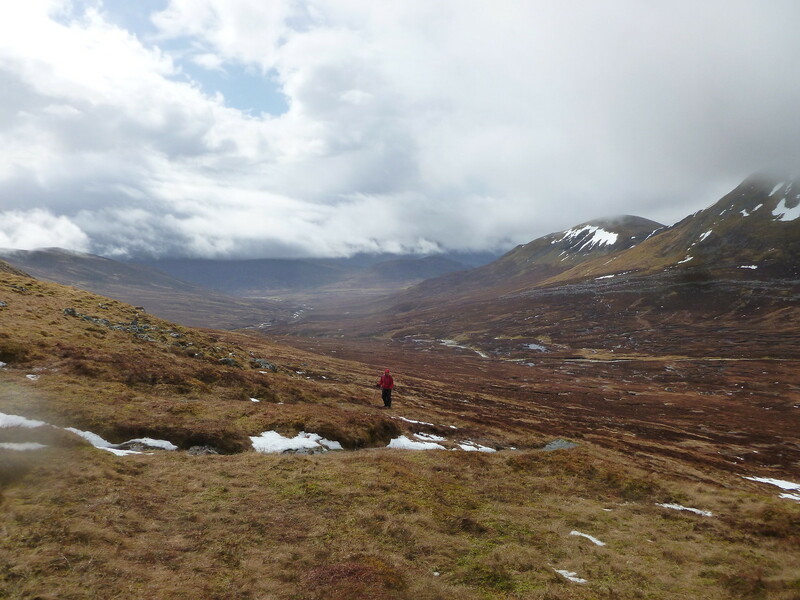 The wind was ever present and the terrain rocky underfoot making conversation difficult, but sometimes one of the most enjoyable elements of a walk in the hills is the solitude and silence so we passed a very pleasant 2 hours trek across the mor. 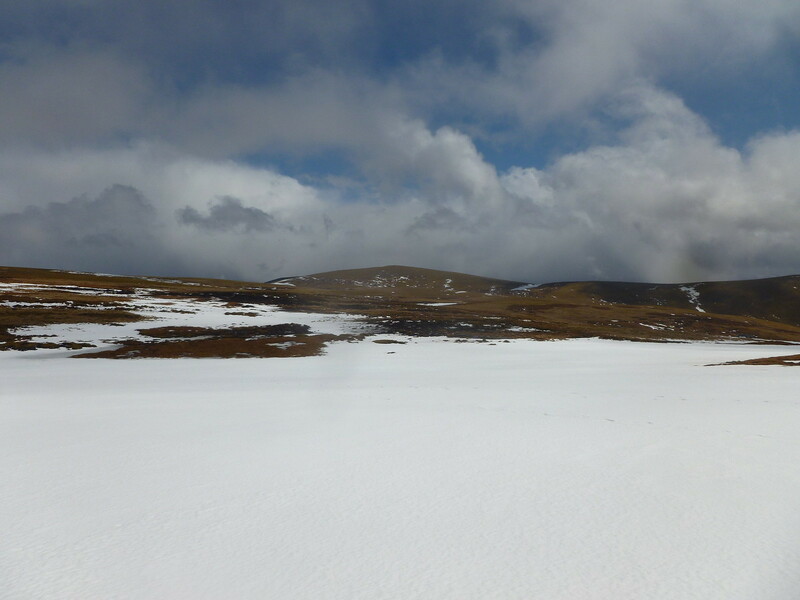 As we approached Carn Sgulain, the drops got slightly larger and the bogs returned, as did the snow. 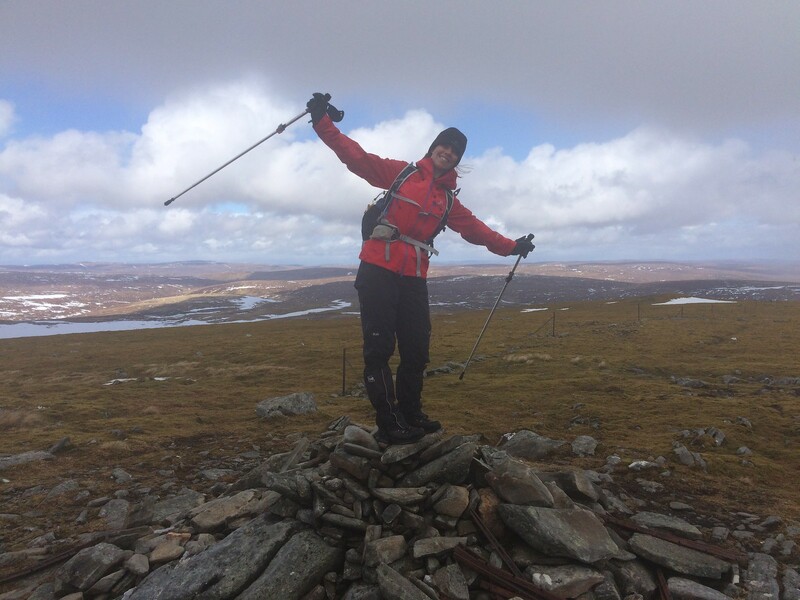 We continued to follow the fence posts, and as we approached the summit, the clag and snow cleared and we had a clear summit at last! Of course it didn't, and before long we were being whipped in the face by snow and wind and it was horrible. It was so unpleasant that I was tempted to turn out of the wind and wait it out for 10 minutes. 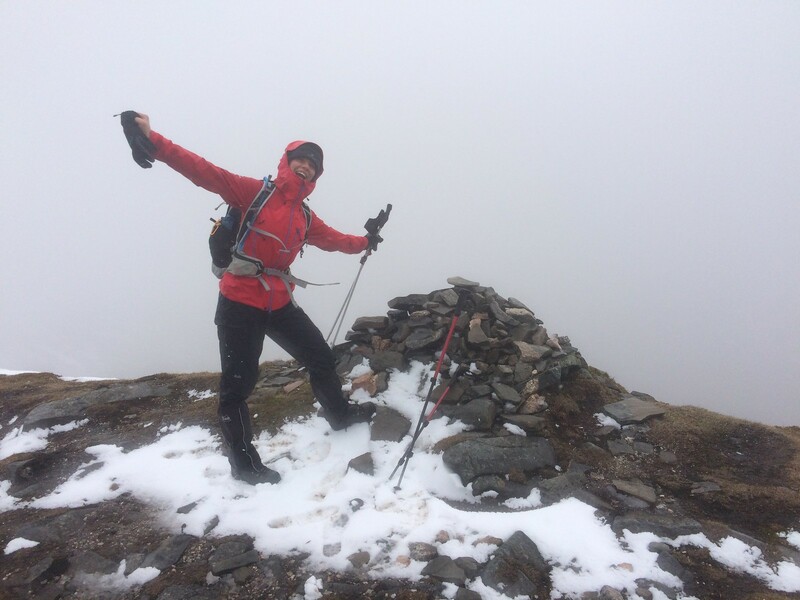 We picked up the path and climbed the final pull up to the summit, where the views were still blissfully clear. 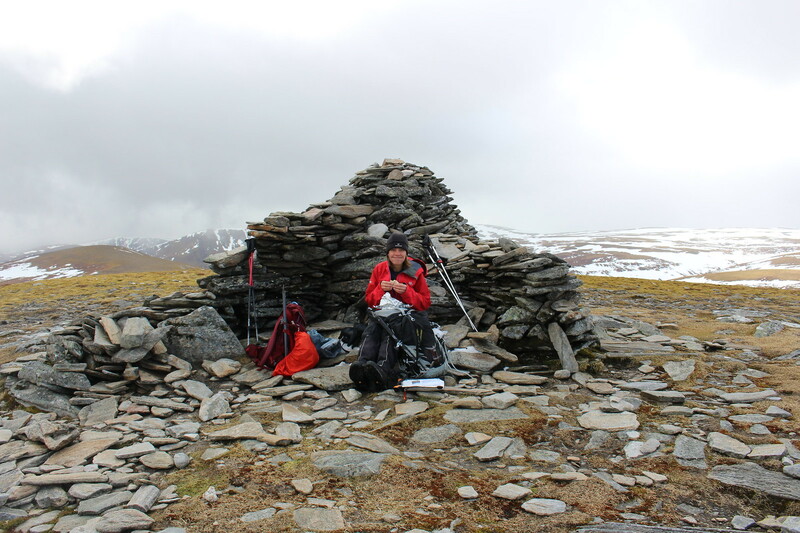 We sat down in the wind shelter and enjoyed a sandwich, and seeing the bad weather approaching, added more clothes. Heading down, we were unsure if the bridge was still standing, and as we were certain that we wouldn't be able to cross without one, I suggested we head down a bit further upstream where there was another bridge marked, as the alternative would be a difficult and boggy walk down the East side of the river to the road. Bog hopping not being my favourite pastime, I got a little left behind and eventually came to a river which was flowing healthily down to join the torrent that we would eventually have to cross. Unfortunately this required crossing first and it looked awful. There were no good crossing places, and the best of a bad lot would require wet feet, so out came the big bin bags again. 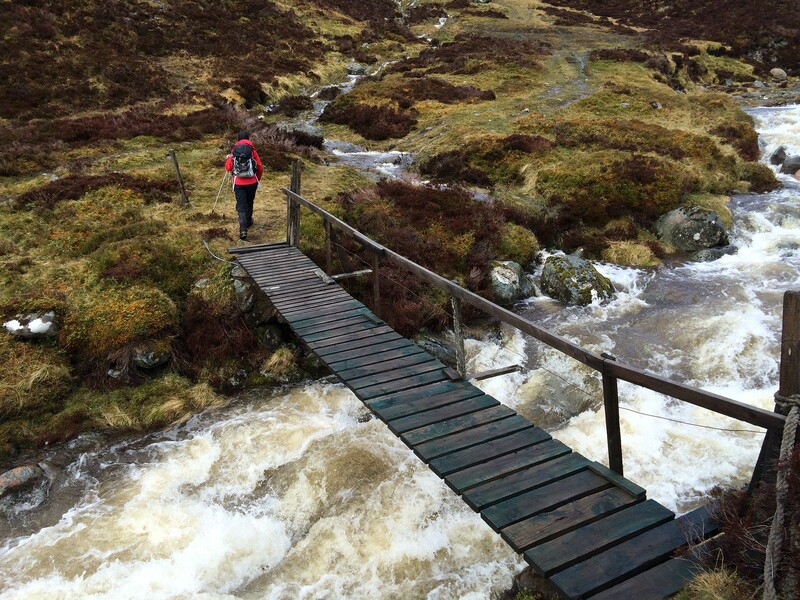 I nervously made my way across and collapsed on the other side, relief flooding through me. 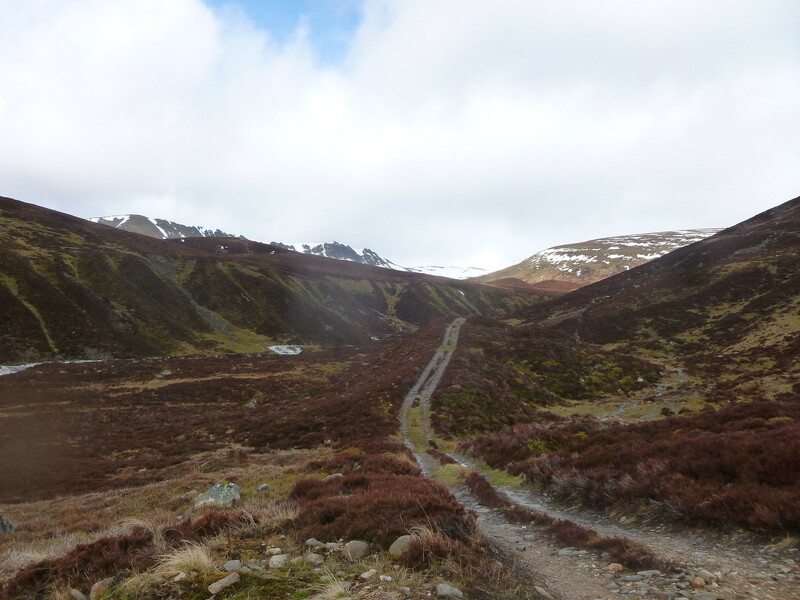 Safely across, all that remained was to march down the hydro track to the car. 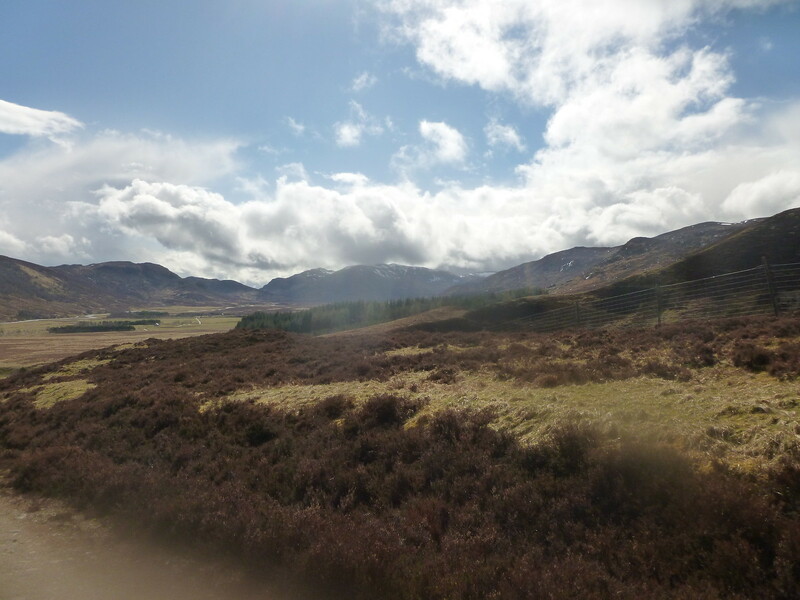 The sun was shining and the views back up the Glen were stunning, as was Glen Banchor ahead. 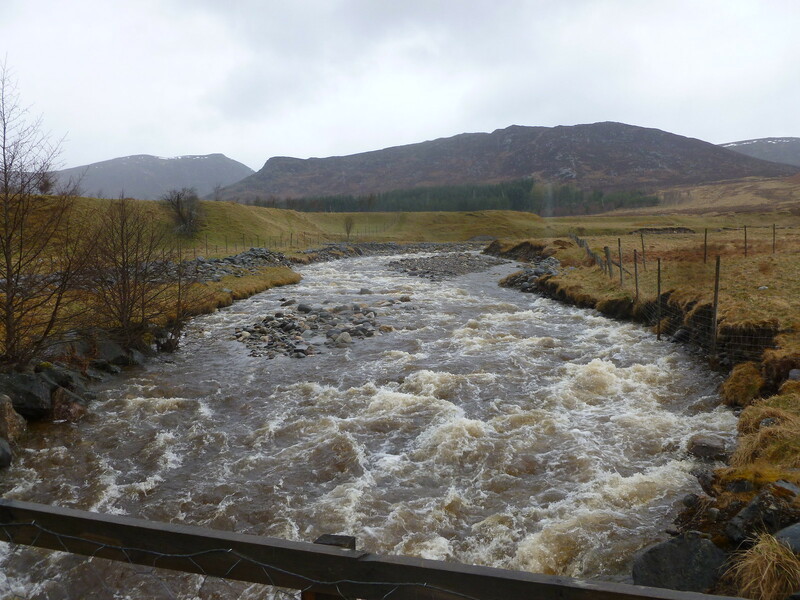 On reaching the car, we could feel spots of rain so disrobed quickly and jumped into the dry! 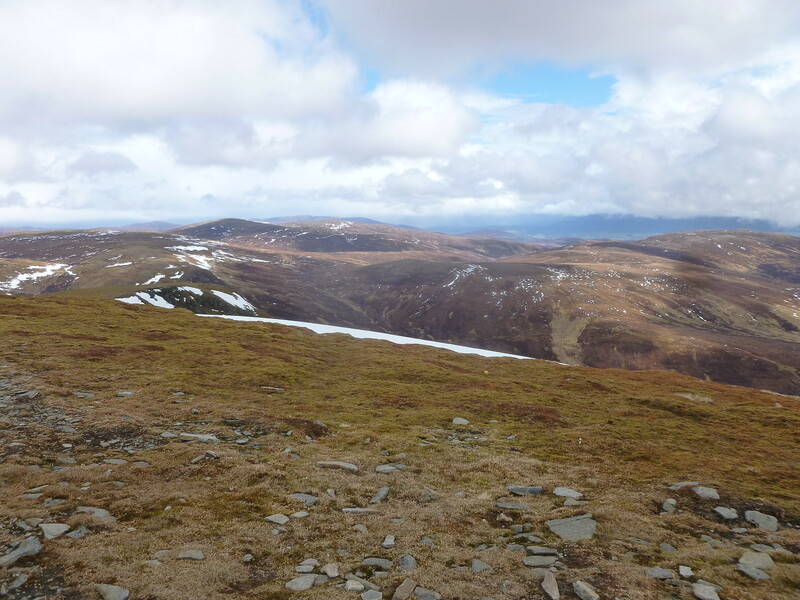 Finishing off our sandwiches and tucking into a packet of caramel digestives (yum) we headed back down the road, having enjoyed a successful weekend of walking in all conditions! Microwave on 900 for 3 mins, stir and microwave on 450 for another 3 mins. The sandwich shelter looks like it would be a life saver. And the bridge Hugh is indeed a ninja,and totally fearless. I bow.